Bags of all sorts are the workhorse of packaging. Our extensive line of the many types of bags offers our customers all of the ease of use, speed and cost-savings of this extensively used packaging alternative, to make their packing operations more efficient and cost-effective. No other packaging method is used in as many ways as bags. Of course, the wide range of bags available is generally utilized for packing relatively small items for shipping and storage. But because of its ease in use and its relative low cost, this once-traditional method is finding an increasing number of applications. Polyethylene bags, which do not have padding, are suitable for a wide variety of packaging applications and hold everything from small parts to documentation included with other products to all types of food items. Our polyethylene tubing is basically polyethylene bags on rolls, for convenience of use in industrial and production line environments. Polyethylene bags have some unique advantages. For one thing, they stretch, which allows bags to be of thinner gauge while providing the same strength as standard low-density materials, and they can be used as dust covers for sensitive items. In addition, because they are transparent, they can be used to display products for identification and appeal to customers. 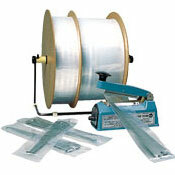 With polyethylene tubing, the use of a sealer cutter will greatly increase speed of packaging. Care should be taken when using polyethylene bags, because bags that are too thin for the items they contain will allow the items to break out. When using polyethylene tubing, a minimum of one (1) inch should be allowed on all sides for easy insertion of the product being shipped. 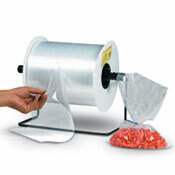 Polyethylene bags are available in numerous models, but the basic model is made with virgin, low-density resin, so they meet the requirements of the Food & Drug Administration for food applications. 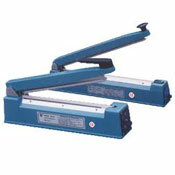 They come in both flat and gusseted formats. All bags are manufactured from seamless tubing, with the bottom sealed for extra strength, and they can be heat-sealed for security. 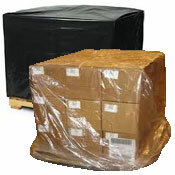 Polyethylene bags are available in open top and reclosable models. Our reclosable bags are available with off-set ribbed openings for effortless opening, reinforced zippers to resist tearing and full-gauge zippers with zipper guides to provide ease in use and secure sealing. 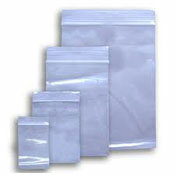 Click Here to see available Polyethylene Bag Sizes. Our polyethylene tubing comes on rolls, for convenience of use in industrial and production line environments. 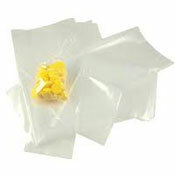 It is made from virgin resin and meets FDA requirements for food applications. All sizes come on 12-inch diameter rolls, with 3-inch cores, with widths from 1 ½ inches to 36 inches, and in thicknesses from .0009 inches to .006 inches. Weight per roll is approximately 3.4 lbs. per face inch. Pink anti-static tubing material also available.